Sleep Apnea Management: Is a Snoring Mouthpiece a CPAP Alternative? Struggling with Obstructive Sleep Apnea (OSA) or chronic snoring can be a real pain. There are many sleepless nights and endless hours of searching for the best solution. Moreover, there’s the huge amount of money you may spend trying different solutions. For some people, an effective solution for sleep apnea is the CPAP machine. However, not only is it expensive, but people are unable to easily adapt to using it. Why Do People Shy Away From CPAP Machines? Do Non-Prescription Sleep Apnea Mouthpieces Work? Did You Say Sleep Apps? Should I Replace My CPAP Or Use a Combined Approach? CPAP machines are expensive, with prices ranging mostly from hundreds to thousands of dollars. Moreover, there are other accessories you may need to buy in order to fully benefit from the devices. Since neither sleep apnea nor chronic snoring is considered a medical problem by Medicare and most health insurance companies (even after extensive research has proven otherwise), you may be required to buy all the accessories from your pocket. This, sometimes, is impossible for most patients. Another reason why people shy away from CPAP machines is claustrophobia (the feeling of being suffocated). In discussions in sleep apnea forums, most new users complain of taking long, up to even 5 months, to adjust to the machine. Some people find the mask restrictive and the hose obstructive, which make their overall experience unpleasant. The two most popular gadgets that can be used as alternatives to CPAP machine are the Tongue Stabilizing Device (TSD) and the Mandibular Advancement Device (MAD). The TSD helps avoid snoring or sleep apnea by preventing your tongue from falling in the back of your throat. The device is worn on the tip of the tongue and held in position by suction. The MAD resembles a sport-style mouth guard in design. It works by holding your lower jaw in front of your upper jaw. In doing so, the device enables your airway to stay open and hence avoid snoring. Temporary blockage of the airway is what causes sleep apnea and snoring. These two sleep apnea kits are both very effective. The TSD takes less space in the mouth. Therefore, you wont have the uncomfortable feeling of sleeping with a full mouth, something users of MADs complain of. These sleep apnea devices can both be prescribed by a doctor. They will cost you about 1,500$ or more if you are funding your treatment from your pocket and not through insurance. However, if you are looking for cheap snoring solutions, non-prescription snoring mouthpieces may be a great alternative. The most obvious difference between sleep apnea mouthpieces and non-prescription mouthpieces is their structural design. Prescriptions mouthpieces are usually more compact as they are built with high quality resins. They also have a more perfect fit and tend to be more effective since they are custom made for you by specialists in a dental lab. On the other hand, non-prescription mouthpieces are just copy-cats of sleep apnea mouth-pieces both in physical design and function. They are however mass manufactured and are composed of easy-to-mold thermoplastic resin. You can therefore achieve an ideal fit using the boil-and-bite technology in the comfort of your home. Some models allow a small adjustment degree. However, you will have to consult with a doctor to increase the effectiveness of the gadget. Non-prescription TSDs are also somewhat identical to prescription gadgets but they are meant to stop snoring and not sleep apnea. If you have been diagnosed with sleep apnea, you are prohibited from self-fitting a TSD since this can pose as a health risk for you. Some of these problems are common even with MADs and tend to diminish with continuous use. The success of managing sleep apnea using MADs and TSDs therefore varies among individuals. Most people that buy non-prescription mouthpieces to manage their sleep apnea are usually looking to save money. These over-the-counter gadgets cost a fraction of the other sleep apnea treatments. 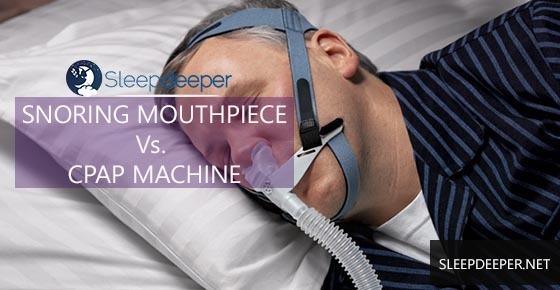 Whether an over-the-counter mouthpiece will be suitable for you will depend on the cause of your sleep apnea. Sleep apnea can be as a result of different issues, each which require a different treatment approach. Some causes includes issues with the throat, tongue, excess weight, nasal cavity and, in some cases, how your brain communicates with your body during sleep. Sometimes, you may be suffering from chronic snoring but not sleep apnea. This is why its advisable to consult your doctor before settling on any treatment plan. However, people take unique approaches to finding a solution to their dilemma. Some try different treatment methods; from the cheapest one until they find the most favorable. Other people extensively research, visit doctors, do self-monitoring and even undertake a sleep study before opting for any form of treatment. Whichever the approach you take, over-the-counter prescription mouthpieces are the cheapest sleep apnea treatments available. So, if you are searching for the least expensive way of addressing your problem, buy a TSD or MAD online. However, you should speak to your healthcare provider about this just in case the gadget you settle on can potentially cause some complications. If you would rather take a more qualified approach, then the first step is to contact a qualified physician. Some doctors will direct you towards using prescription models. Their reasons may be genuine or they may just do so for financial gain. Other doctors may suggest purchasing oral devices online if you suffer from mild to moderate sleep apnea. Since doctors take different approaches to finding solutions to specific cases, you should get the opinion of more than one doctor. Taking feedback from your partner or other loved ones, and monitoring your sleep using smartphone apps can also save you money, time, and resources. You will also avoid frustrations. Yes! Thanks to technology, you can now monitor your sleep using various sensors in smartphones, including data logging and microphones. Sleep as Android is an excellent tool for tracking every part of your sleep. This app can record when and how often you wake up, duration and frequency of your snoring. It also has a challenging alarm silencing feature which can help you wake up. Information recording by this app can help you and your doctor come up with the correct diagnosis for your condition. The iPhone app Sleep Assess is a great tool that can help you understand your condition. The app consider factors like how exhausted you wake up and your snoring incidences to determine whether you have sleep apnea. Once it has determined your condition, you can go with the reports to your doctor for further investigation. Another app is the Sleep Apnea Monitor. This app is of great help once your condition has been confirmed. It keeps check on various data points to help you figure out how severe your condition is and if you are making progress with your treatment. The combined approach of managing sleep apnea involves both undertaking a CPAP therapy and using a non-prescription mouthpiece. Some people that have taken this route, with the help of their doctor, have found relief in using TSDs, for example to lower the pressure by which their CPAP functions at. The combined approach must however be carefully monitored by a doctor to ensure its effectiveness and that you are not at risk. Reports show the combined approach can help sleep apnea patients get cleared of their condition and have their CPAP run at lower pressure. The decision on whether to combine the CPAP with a MAD or TSD depends on your specific condition and should made with the guidance of your doctor. For people suffering from sleep apnea as a result of obesity, losing weight can assist them become independent of the CPAP and end up only using a mouthpiece. In some cases, after successful weight loss, some people stop snoring or suffering from sleep apnea, and therefore stop using mouthpieces. The time to stop using your CPAP machine really depends on your individual needs and treatment progress. However, if you and your doctor have come up with an agreement to try purely using mouthpieces, check out our comprehensive mouthpiece comparison chart. In the chart, you will see the main differences (features and price) of the products currently in the market. The chart can help you and your doctor decide the ideal device for your case. One excellent mouth guard that has been recommended by sleep apnea patients is the AirSnore. Clinical trials have proven that the gadget can help with sleep apnea. However, this is not a guarantee that it will be ideal for your case since every person is unique. You can try it though since you will not need to sleep with constrictive masks, uncomfortable hoses or pressurized air. Even better, it costs less than prescription MADs and you do not need prescription to purchase it. There is really no substitute for a good night sleep. Quality sleep will ensure you wake up fully rested and help maintain your productivity. So, even though it might be stressful going for several doctor visits and researching for an appropriate snoring or sleep apnea solution, you will find it worth it when you can finally sleep soundly and safely.